Sister Rosemary Loomis delivers a memorial message for the Franklin County Guardian Service Board. In the Gospel of Matthew, Christ says “Inasmuch as ye have done it unto one of the least of these my brethren, ye have done it unto me.” In Franklin County, OH, the Guardian Service Board serves those who might be considered the least of Jesus’ brothers with love and compassion, helping them navigate the maze of social services they need to survive. The social workers and social service professionals of the Franklin County Guardianship Service Board become less like caseworkers and more like friends as they work with their court-assigned clients. Often the court-appointed guardian is the only person aware when a ward of the state dies, and that guardian is left to close the file and grieve alone. 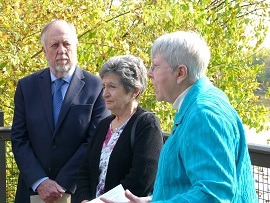 On October 25, a sparkling fall day in Columbus, OH, the members of the Franklin County Guardianship Service Board gathered at a city park on the edge of the Scioto River to celebrate the lives of their clients that had died in the past two years. 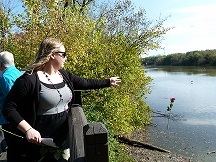 Kristine Oberlin, a social worker with the Franklin County Guardian Service Board, tosses a rose into the Scioto River in memory one of the people that she served. The remainder of the service was a perfect reflection of Sr. Rosemary’s words, as each person was recognized by name, and a rose was tossed into the water of the Scioto River in each person’s memory. Sr. Rosemary has been involved in grief counseling for a number of years. She is a member of the National Catholic Ministry to the Bereaved and Parents of Murdered Children and Homicide Victims Survivors. She serves as the After Care Coordinator for Egan-Ryan Funeral Home, and was honored by the National Organization of Parents Of Murdered Children, Inc., (POMC) with the Father Ken Czillinger Award in recognition of her service in supporting the mental health of survivors of homicide victims.